Is the Cranleigh Society shutting the stable door after the horse has bolted? Here’s the latest message from Cranleigh’s ‘former rather weary watchdog’ that suddenly appears to have a new lease of life. But, as Cranleigh sits on the cusp of becoming Waverley’s fourth town, is it now too late to save its rural character? The Committee of Cranleigh Civic Society announced this week that it has been strengthened and energised to fight the growing avalanche of proposed housing. In the wake of the adoption of ‘Your Waverley’s’ Local Plan, far be it for us at the Waverley Web to want to pee on anyone’s fireworks, but isn’t it all over bar a lot of shouting? 41 councillors voted for – one was against – and three councillors abstained! All Cranleigh members voted for the plan, which will undoubtedly lead to yet more housing in Cranleigh. But then, why wouldn’t they? Most of them were taking part in secret meetings with developers and planning officers long before the ink was even dry on the Daft Local Plan to determine just where thousands of new homes on the countryside would go! And, as one Cranleigh councillor, the late Brian Ellis, stated at the time – Cranleigh shops need more footfall!’ Now those same councillors actually believe an adopted local plan will minimise the harm! Do they? Do they really? Whilst most of them were busy opposing development at Dunsfold Aerodrome, believing Cranleigh should become a New Town, they were also busy meeting with developers, even in their own homes, planning Cranleigh’s demise. They should be careful what they wish for – soon they may get the worst of both worlds! The new man heading the CCS, Terry Stewart, was Chair, then President, of Dorset CPRE (Campaign to Protect Rural England) for eight years. 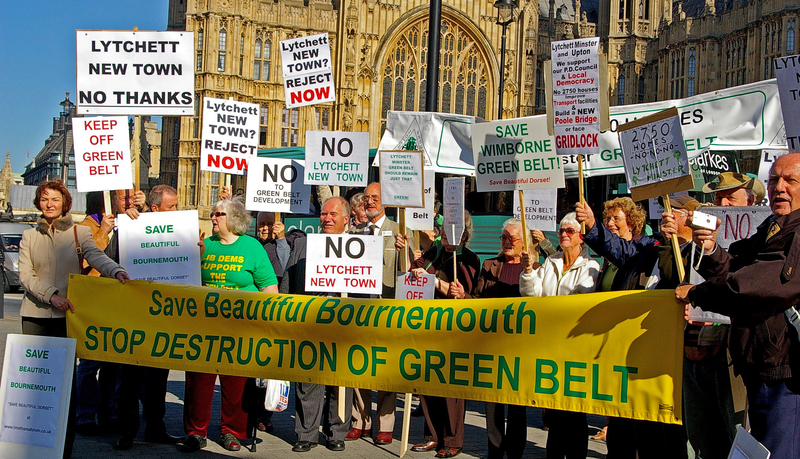 Whilst there he was faced with the threat of housing developments throughout the Poole and Bournemouth Green Belt so lead a team of six villages and communities to defeat the proposals. This included MPs speaking to a demonstration outside Parliament and a procession to Downing Street to present a petition to the Prime Minister (see photo). 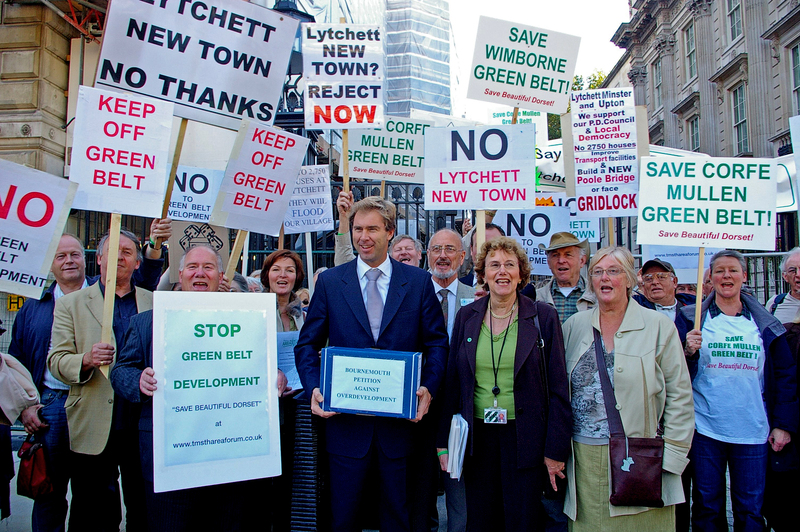 The proposals were defeated – as were plans for a new village at Lytchett Minster. (See photos below). It says experience shows that attacks on the Green Belt and unprotected beautiful countryside can only be defeated if there is a strong, professional team leading an active, widespread community with clear objectives. So the new Civic Society Team includes a retired Solicitor, two experts on building and infrastructure, an insurance expert and environmental and wildlife specialists – meeting on a fortnightly basis or more often if needed. The society understand that villagers may believe that, whatever they feel, the Council and Government will do whatever they want to do, but the successes referred to above demonstrate that these battles CAN be won! Apathy only plays into their hands – do you really want this to happen? It claims, ‘CRANLEIGH IS UNDER AN INCREASING THREAT FROM DEVELOPERS – changing your quality of life and the Cranleigh we know and love.’ Since 2014, Waverley Borough Council has approved the building of over 1,300 houses in Cranleigh. Think for a moment the huge impact this will have on the A281, our B-roads and country lanes, our already overloaded and inadequate sewage treatment works and the crumbling infrastructure – and the increased flooding risk. Also, please remember that we are the only main settlement in Waverley without a railway station. Despite all this, more and more new planning applications are regularly being received. Just a few days ago we heard that Dunsfold Park is virtually assured of being given approval for 2,600 new houses – and that is just the beginning! Just think of all those extra cars entering and using the A281. We have heard credible accounts of a developer acquiring “options to buy” large tracts of land down Knowle Lane – is the idea for Cranleigh and Dunsfold to merge? Are we to become another Crawley? Or does the Waverley Web dare to suggest … Crandun-for! Cranleigh Civic Society needs YOUR support so please visit our website – www.cranleighsociety.org – Facebook and Twitter links and join our membership. We are working hard on YOUR behalf to protect our very special village, its environment, and wildlife. What’s the magic number today Waverley Planners? The number is 54! Yes 54 new houses headed for Elmbridge Road in Cranleigh. The decision will be made tonight (Wed 28th June; 6.30pm) at Waverley’s Joint Planning Committee. We urge you to attend and make your voice heard! The map below shows the area between Elmbridge at the top and the blue Littlemead Brook stream at the bottom which is.. subject to tonight’s Planning Application (Planning Ref : WA/2016/1921) recommended for Approval by Officers for 54 homes. Our friends at the Cranleigh Society say: “This entire site was underwater in Dec 2013/Jan 2014 – the road, which was higher than the site, was impassable. In January 2015 about 30% of the site was flooded. And then there’s the smell from the sewage works..” Thakeham Homes have stated that “odour is not considered to be a constraint to residential development at the site”. Those three little blue SUD’s will be working overtime! We agree with the Cranleigh Society – write to Anne Milton, Cranleigh’s MP and ask her to ‘call in’ this outrageous application. Email her on anne.milton.mp@parliament.uk with reference WA/2016/1921 Land South Of Elmbridge Road, Cranleigh – perhaps notice will be taken if lots of people request it! Perhaps that Vote of NO CONFIDENCE fell on deaf ears? As you are aware, Cranleigh Civic Society held a meeting in the Village Hall on 25th May to discuss the planning permission already granted and the further huge amount of housing being earmarked for Cranleigh in the draft Local Plan. Many residents expressed their deep concerns about the relentless growth of new housing in Cranleigh, particularly as Waverley Borough Council has simply not dealt with Cranleigh’s serious infrastructure problems first. We have not received a reply from this letter yet. Also discussed at the meeting was the petition we have been running to ask our MP to insist on our drinking water to be tested for the risk from asbestos, as 29.6% of our water pipes are made from asbestos cement. The petition has now closed at 714 signatures and we have now sent this to Anne Milton for her action. We are now investigating the options available to us and we will let you know when we know more. – Write to your MP Anne Milton NOW (email anne.milton.mp@parliament.uk). Whilst we as the Cranleigh Civic Society are strictly non-political, you may feel that you have been let down by your MP in not stopping the relentless attack by housing developers on Cranleigh’s green fields, particularly as it is Government Policy that brown field sites should be built on nationally first. – Write to the Waverley Borough Councillors (details are on their website) to tell them you are not happy with the way the decisions are made. – Turn up at the Council Offices at The Bury’s, Godalming when the Joint Planning Committee meet to vote on the larger housing applications. The public gallery only has a few seats so either turn up early or turn up just for the arrival of the councillors before the meeting so that they can see that people of Cranleigh do really care. Will the people of Cranleigh get a response? Don’t hold your breath, because ‘Your Waverley’ doesn’t give a jot what Cranleigh people think. If it did, it wouldn’t be putting out RFP’s (Request for Proposal) to sports consultants around the country to build a new Leisure Centre on the Snoxhall Playing fields – on land held by Cranleigh Parish Council on behalf of its residents!